Over 30 years, my previous career spanned every sector of the education scene in Scotland, culminating in the world of higher education – latterly as Director of Recruitment and Admissions at the University of Edinburgh. I have had an active involvement in the development of education policy and practice at corporate, regional and national level and continue to take a keen interest in all contemporary issues. From the competitive international world of student recruitment emerged three driving passions – a pride and fascination in the country of my birth; a love of travel and diverse cultures; and the passion to deliver customer service that exceeds all expectations. A fortuitous opportunity to take early retirement in 2010 allowed me to embark on a new chapter in my life. The obvious progression? Two years of intensive study to gain the Scottish Tourist Guides Association Blue Badge Qualification. New skills, a whole lot of knowledge and the chance to share my passion and enthusiasm while interpreting Scotland for you the visitor. 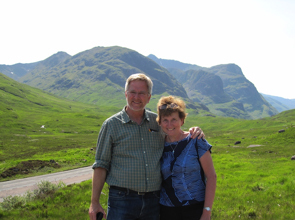 In 2013 I was invited to guide for Rick Steves, Europe by The Back Door on his “Best of Scotland in 10 Days” tours. Thanks to this I now have friends spread all over the USA, Canada and beyond! Today, I balance the role of a tourist guide with an ongoing interest in education at home and abroad through roles including Governor of a large, independent boarding school in Scotland and Director of the Advisory Board of a student recruitment agency based in Thailand. Outside the guiding season, winter is now used to indulge my own passion for travel!